The Island of Dr. Moreau is a film based on an H.G. Wells novel published in 1896, a sci-fi classic written by a legendary author that spawned a sci-fi classic directed by a talented filmmaker. 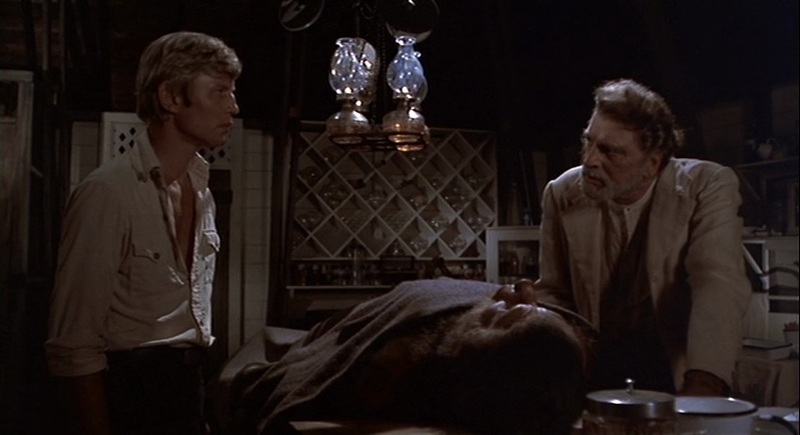 Don Taylor oversaw more television episodes and made-for-TV movies than you can count, but he also directed films in the Planet of the Apes and Omen franchises, as well as The Final Countdown, a Kirk Douglas/Martin Sheen action/time travel flick. There’s more than enough genius to go around behind this 70s take on the timeless story of Dr. Moreau, and the result is one of the better genre films you are likely to see, a complete success in the world of vintage movies that translates superbly to modern-day screens. When a British ship sinks in the Pacific, engineer Andrew Braddock soon becomes its sole survivor, his lifeboat drifting ashore on a remote island, hundreds of miles from anything. Lucky for him, perhaps, there’s a small settlement within the jungle, a high-class tropical locale run by the mysterious Dr. Moreau. Braddock is told that a ship will be coming to drop off supplies, that he can leave at that time, and that meanwhile he is the good doctor’s guest on the island. There’s even a lovely lady, Maria, to keep him company while he waits. But he may not ask too many questions, he may not interrupt Dr. Moreau’s research, and he may not leave the compound after dark. Braddock quickly becomes curious and then suspicious about just what the doctor is up to, so he does some investigating inside the small fort and outside its walls, in the heart of the jungle. What he discovers goes beyond his understanding and his moral code. Dr. Moreau has escaped persecution from his peers and is carrying out mad science where no can find him. His dream is to discover the link between mankind and animals, to find out just what it is that makes us civilized, to locate the genes that determine our humanity. He is willing to do whatever it takes to prove his theories, including torturing the local animal life, and he isn’t about to let Andrew leave the island and ruin the glorious plan. 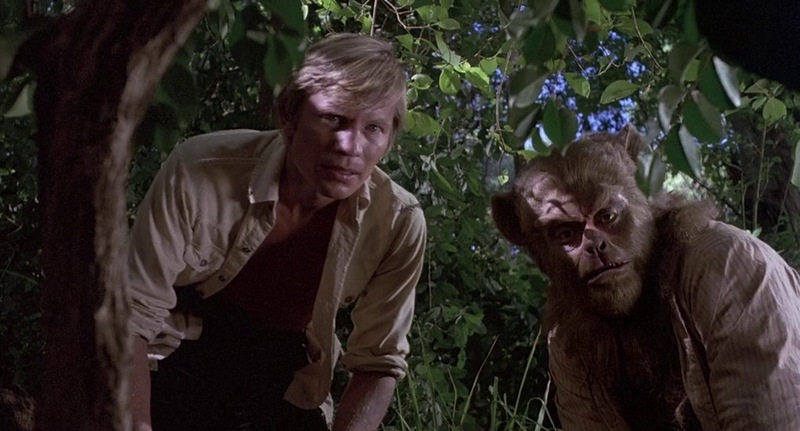 And the movie itself harnesses the feel that Wells was aiming for, crafted in super 70s style, and gifting us with something that we can enjoy 40 years later with ease. The music, the set, the costumes; it’s turn-of-the-century and 70s at the same time, it’s Planet of the Apes meets Robinson Crusoe in a near-perfect way. You can sense the Apes inspiration, the action has the same tone, but don’t blame Taylor for carrying that over, he knows when a good recipe should be copied. 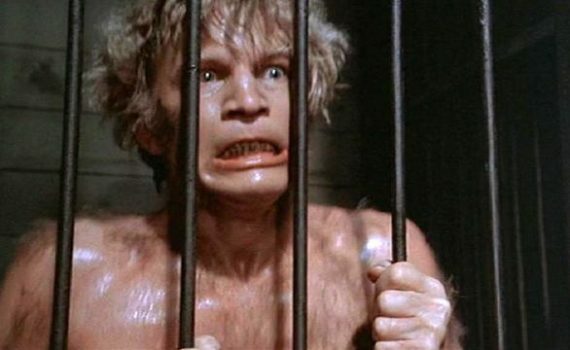 And give Michael York credit for pulling off the lead role and for taking the project onto his shoulder. He’s a classic in his own right, and that should be acknowledged: Logan’s Run, The Three Muskateers, Murder on the Orient Express. The ending is wonderfully ambiguous, which I loved, although there is some removed footage that you can find if you look and that will give you a definitive answer, if you want to know it. 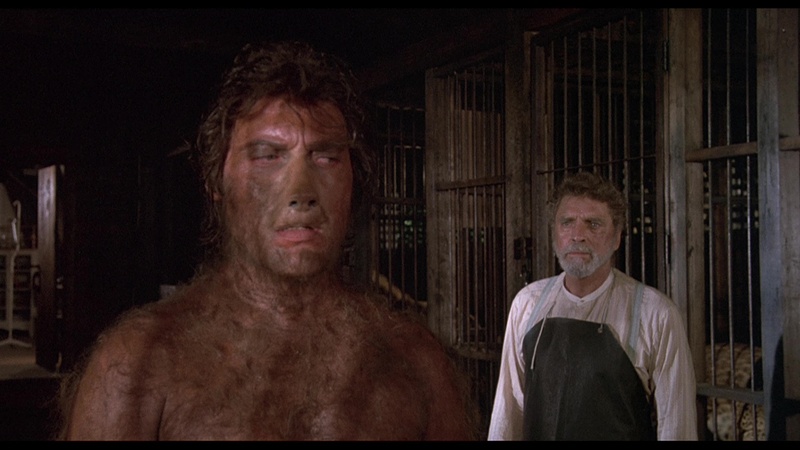 Overall, The Island of Dr. Moreau is a gem in every way, a classic that should be remembered, a film that hasn’t been diminished with the passing of the years. Video – With an aspect ratio of 1.85:1, and with no other video details available, the quality is on par with what you should expect from a 70s movie transferred to a DVD; grainy but satisfying. As long as you know what the era produced, you won’t be surprised by the picture quality, and you may actually be pleased by the attention to detail, the importance the visuals are given in each scene. Audio – The disc was done in English Mono, with an option of English subtitles. No other audio details are available, but again, you shouldn’t be expecting amazing things from this decade, from this medium. The backing soundtrack is nice, very creepy and very thrilling, which is enough to get audiences by. Extras – There are few special features on the disc. The first is a trailer for the film. Audio Commentary with Jeff Belanger and Dr. Dreck can be enjoyed along with the film. And The Island of Dr. Moreau as a Theological Grotesque by Gorman Beauchamp is a 7-page essay through which you can scroll and enjoy. DVD Talk Collector Series. If you love 70s flicks and sci-fi, this film should be added to your short list, kept on a shelf with the classics that will never be forgotten. It is slightly less known but as deserving as the hits of the genre and of the decade, and should be given its proper respect. Val Kilmer, Marlon Brando, and David Thewlis did a version in 1996, but it isn’t nearly as good; this one should be the definitive film. The video, audio, and extras may not be very impressive, but that can be forgiven; we know that movies made 40 years ago don’t look the same as those made today. But don’t overlook the qualities that are present, that are strong, and that are ready for you to enjoy whenever you want to give them a chance.